Top clamp nut machined from 6061 T6 aluminium. Light weight and good looking. Clear anodised for a long lasting finish. 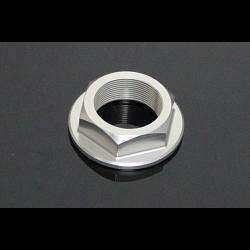 This nut is a direct replacement to the top nut on many Honda machines, such as MC18~28, RVF400, NSR150SP, CBR250/400, CBR900. The list is long.